That churches was build for defending the catholic peoples from the Turkish and Tartars invasion. Some of them are 700 years old. The story of these places is fascinating with moments of glory and decay. This area was one of the most prosper from Transylvania when the Saxons live here. After the Ceaușescu they go away from Romania and now these villages are poor, but they kept a special charm. Transfer București-Zărnești (city tour - Brașov). Braşov is located in the central part of the country, about 166 km north from Bucharest. It is surrounded by the Southern Carpathians, and is part of the Transylvania region. 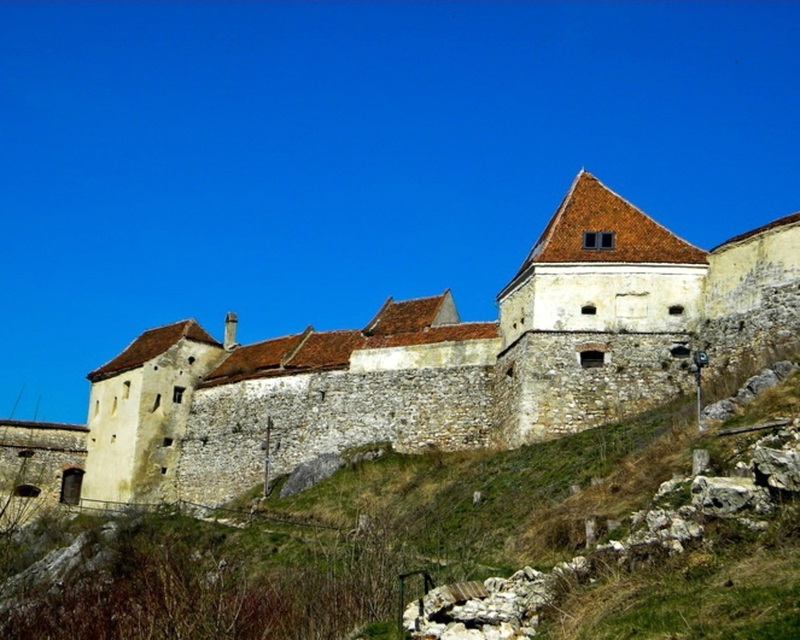 Centrally located, Braşov is a good starting point for trips around Romania. It is also the largest city in a mountain resorts area. The old city itself is very well preserved. Temperatures from May to September fluctuate around 23°C / 75°F. Braşov benefits from a winter tourism season centered on winter sports. "Poiana Braşov" is the most popular Romanian ski resort and an important tourist center preferred by many tourists. Accommodation to "Mosorel" guesthouse in Zărnești. Transfer Zărnești-Sighișoara. City tour of Sighișoara. Central Sighişoara has preserved in an exemplary way the features of a small medieval fortified city, it has been listed by the UNESCO as a World Heritage Site. Each year, a Medieval Festival takes place in the old citadel in July. Sighişoara is considered to be the most beautiful and well preserved inhabited citadel in Europe, with an authentic medieval architecture. In Eastern Europe, Sighişoara is one of the few fortified towns which are still inhabited. The town is made up of two parts. The medieval stronghold was built on top of a hill and is known as the "Citadel" (Cetate). The lower town lies in the valley of Târnava Mare river. For the next two days we'll follow "Saxon Greenway” Transylvanian Saxon Heritage Trail, which starts from the picturesque mediaeval citadel of Sighişoara. The trail passes through a number of traditional Saxon villages, renowned for their castle-like stone churches and colorful houses with lime-washed facades and tiled roofs, nestling among narrow valleys, wooded hills and rich flower meadows. Using county and local roads, as well as old carriage lanes, the Saxon Greenway is the best way to understand and enjoy – by foot – the landscapes of high aesthetic and conservation value of the Sighişoara - Târnava Mare area, recently included in the European Natura 2000 ecological network. Today we’ll walk to Saschiz village. Saschiz Fortified Evangelical Church is part of the UNESCO world heritage. The fortress of Saschiz is situated on the hill near the church. On a stone fortress is carved 1343. The village is attested in the years 1308-1310 and it was populated by “secui” - Hungarian ethnic group, until the late thirteenth century, when it becomes a town inhabited mainly by Germans. Accommodation in one or more local guesthouses. Another day for discovering Saxon villages. In our way we’ll cross Viscri - a small village, with no more than 500 inhabitants, from which only about 27 are Saxons. People say that Viscri hide the most picturesque fortified church of the Saxons from Transylvania., which is also part of UNESCO World Heritage. Viscri is also known due to the great job in restoring done by the “Mihai Eminescu Trust”, the foundation lead by The Prince of Wales. The trail continue crossing small villages and here we are in “Făgăraș country”, at the foothill of this impressive mountain. Ohaba village is a “must see” because of the old water mill which is still in use. A day spent between two important and different areas: “Făgărașului country” and “Bârsa country” .We’ll cross and visit Șinca Nouă village with the only Orthodox monastery in the Făgăraș Country who escaped undestroyed, because it was not found. When Maria Theresa started the Catholicism campaign in Transylvania and setting up border regiments made up of locals, people from Şinca refused enrollment and have not renounced to Orthodoxy. In the last part of the day we’ll walk up on a stunning hilly ridge and follow a nice descent through old forests to Zărnești village. Accommodation and dinner in a local guesthouse. Prăpăstiile Zărneștiului (Zărnești Gorges)-Piatra Craiului National Park. We start with a descending to the Botorog Spring, from where we climb to the Curmătura chalet, through the Jurassic canyon of “Prăpăstiile Zărneștiului”. Here the landscape becomes even more spectacular - Zănoaga is one of the alpine pastures where from May to September we find shepherds and their flocks. Transfer Zărnești-București airport. We provide: transfer from airport and back, luggage transfer each day on tour, qualified and experienced trekking guides, local accommodation with half board & picnic lunch.